ROTC cadets from Eastern Michigan University formed the color guard for a memorial ceremony held at Lawrence Technological University earlier this year. Beginning with the spring semester that starts in January, Lawrence Technological University students can enroll in an affiliate Army ROTC program and take the full ROTC curriculum that can lead to a commission as an Army officer. LTU is now an affiliate of the Army ROTC program offered by the Department of Military Science and Leadership at Eastern Michigan University in Ypsilanti. All the ROTC courses will be taught at EMU by Army instructors. The LTU students will be able to earn a minor in military science and leadership at LTU. The new ROTC program at LTU comes at a time when the Army is reducing its force and has cancelled more than a dozen ROTC programs around the country. LTU is bucking that trend because of its high proportion of students majoring in science, technology, engineering and mathematics, the STEM subjects, according to Director of eLearning Services Richard Bush, the faculty advisor to LTU’s student veterans group. The ROTC curriculum also supplements LTU’s own leadership curriculum that is required for all LTU undergraduate degrees. ROTC courses can be used to meet LTU’s leadership requirements. LTU already has an Air Force ROTC program. An information session about LTU’s new ROTC program will be held on Thursday, Sept. 25, from 11 a.m. to 2 p.m. in room C405 in the Taubman Student Services Center on LTU’s campus in Southfield. Completion of the ROTC curriculum and some additional Army training programs may qualify an LTU student for a contract with the Army to become a commissioned officer following graduation. Students who commit to four years of active duty and four years of reserve duty could have all of their tuition expenses paid for by the Army. After four years of active duty, an Army officer can expect to earn a compensation package of more than $78,000 plus health coverage. 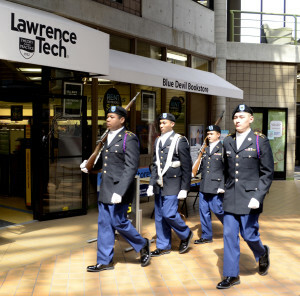 Lawrence Tech offers tuition discounts to veterans. It is certified for the GI Bill and participates in the Yellow Ribbon Program, a federal initiative that helps veterans reduce the cost of higher education. Last November LTU ranked first in Michigan in the inaugural ranking of the best colleges for veterans compiled by U.S. News and World Report. LTU is also on the latest Military Friendly Schools list compiled by Victory Media, the publisher of G.I. Jobs magazine.